Known for her grace, sensuality and elegance combined with authentic, culturally appropriate costuming and music. Maya will enchant your guests with a performance perfectly tailored for your event. Mayas shows are Upscale, Fun and Interactive. Enjoy an exciting performance designed to delight all audiences from family-oriented to corporate venues. We encourage audience participation within standards of good taste. Maya does not perform at all-male events ...unless they are a direct referral. Maya takes pride in being aware of different customs, appropriate dress and behavior, and respects all cultures. The Classic Show is perfect for any occasion! This complete 20-25 minute show features a Grand Entrance with Veil or Isis wings, followed by a captivating mix of dance routines, ending with a Fiery Drum solo. Including your choice of ONE Advanced Prop such as Double Scimitar Sword Play, Cane, Fan Veils, Feather Fans, vibrant Silk Butterfly Wings. Special attention given to the Guest(s) of Honor and group dancing for everyone who wants to join the fun! We encourage audience participation! This option is perfect for Weddings, Quinceañeras, Corporate Events, and Parties! On a grander scale Entertain and Excite your guests with the Ultimate Show. This dramatic 2-Part Series dazzles with TWO complete 20-minute shows, a costume change, your choice of THREE Advanced Props for Maximum Impact! For a nonstop party atmosphere, let the first set energize your reception. The second set is a sure-fire conversation starter during Dinner and will get guests out on the dance floor. *CHOOSE THREE Advanced Props : Double Scimitar Sword play, Fan Veils, Silk Butterfly wings, Cane, OR Feather Fans. Add the thrill of fire to any package! You can choose between the Deluxe Candle Tray Balancing Act, Captivating Palm Flames performance, Sultry Fire Fans Dance or exciting fire eating! Fire safety assistant and insurance included. Perfect for Bachelorette Parties, Bridal and Baby showers, or any festive occasion where you want to celebrate your Inner Goddess!! 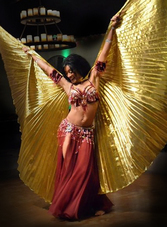 Enjoy a magical night with Professional Bellydance Artist Maya. Complete with coin skirts, Veils, Music and Maximum Glamour! All while learning Authentic Belly Dance moves from a Pro! ​This ultimate Divas’ Night In consists of a 45-minute class, with the option to add a fully-costumed 15-minute show by Maya. Group dancing is one of the oldest forms of Belly dance, bringing women of all ages, shapes and sizes together in a fun, body-positive environment! Women find themselves connecting through dance, sisterhood & laughter. Perfect for Theme parties, Grand Openings, or Expos! If your pre-planned event is the cake, this is the icing for transitioning activities and establishing that special mood. We offer various Themes: Bohemian Gypsy, 1001 Arabian Nights, Egyptian, Moroccan, Greek or Roman. Have your guest of honor make an unforgettable grand entrance accompanied by Maya in any costume theme you wish. Dressed in the finest costumes with Authentic props. Props may include Deluxe Candle Tray, Scimitar Swords , Palm Flames, ISIS Wings, Silk Veils, Fire Fans, Silk Butterflywings to name a few! Throughout your event Maya can gracefully mingle in full costume with props, or provide background dancing throughout the evening including photo ops with your guests.